I love these little faux sapling trees. They are so tiny that you can tuck them anywhere for a bit of nature. wrapping presents, etc. this year! Is anyone else not finished with everything yet? I have 2 SUPER exciting giveaways coming your way!! I think you will love them both! and I wanted to say Thank You for all your comments and love! I appreciate them so much! 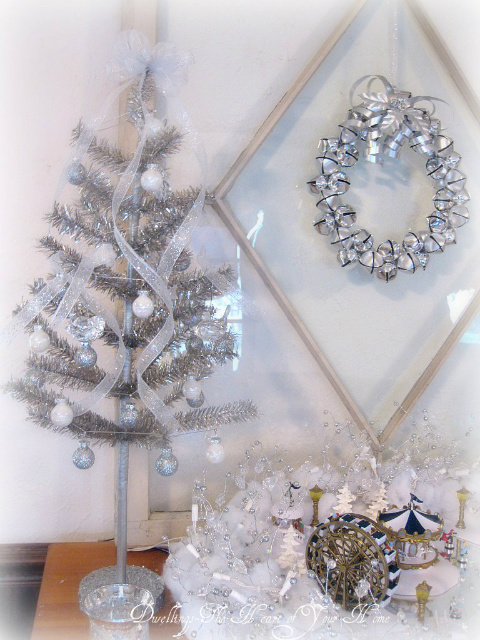 Last weeks edition of Feathered Nest Friday was all about Holiday Vignettes! EVERYTHING in my house like 50 times over!! and I am adding a couple extras this week! 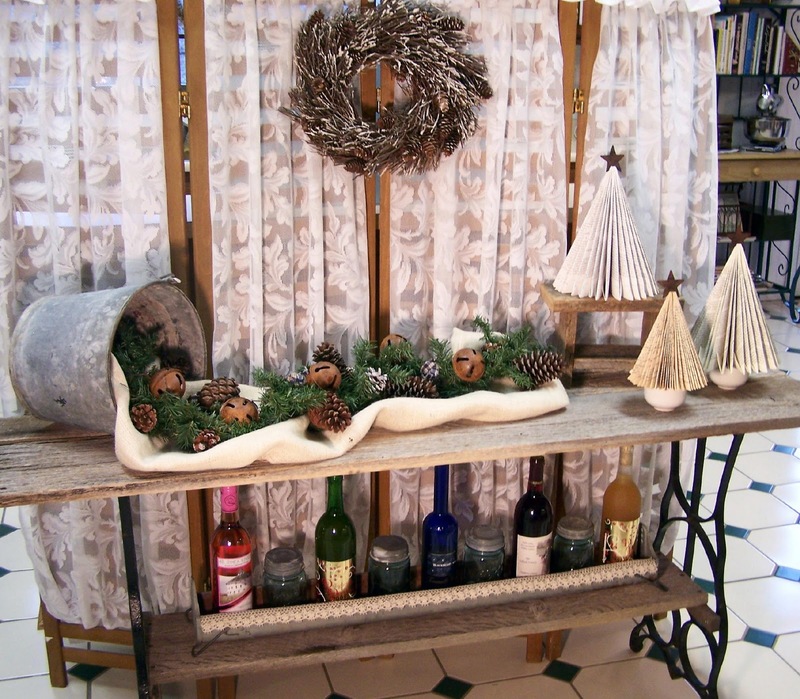 Dwellings- the heart of your home shared a vintage Christmas vignette. 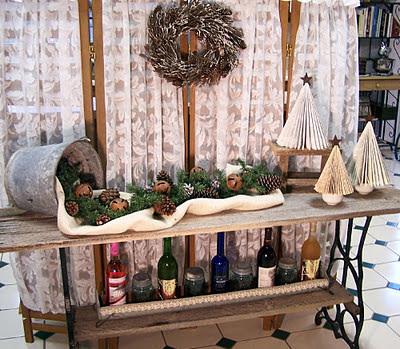 Love Shabby French Cottage Christmas Cloche post! Fishtail Cottage shared a darling little birdie in a nest. Prior shared this darling banner. Thanks so much for the feature Courtney and thanks for hosting!!! Your little saplings in the old drawer look darling! I have some old wooden drawers in my garage. I'll have to try and remember this for next year! Your little trees look great in that drawer. Lovely features too! Thanks for hosting and thanks for joining me at Home Sweet Home. Have a very Merry Christmas! Courtney your bedroom is stunning! 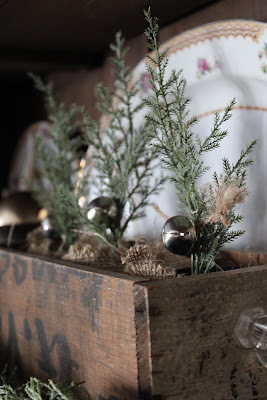 I just love the greenery in the antique boxes looks so very country. Thanks for hosting at this busy time of year. So much beautiful inspiration, as always! Every year I say I am going to be so organized and get everything done by Dec. 1!!! It hasn't happened yet. Not finished shopping and NOTHING wrapped! The tree is up but no decorations on it yet - this weekend it MUST happen! Thank you so much for hosting this great party! Merry Christmas! Gorgeous features and so much incredible talent! :-) Thanks for hosting us friend! The little trees look great in the drawer. Thanks for hosting Courtney. Your decorations look great! The features are so inspiring! Thanks for hosting another great party! Merry Christmas! So much inspiration over here Courtney! You are the pied piper leading the pack with your own glorious ideas!! Your home is simply stunning! Thanks for hosting!! Of course I love the old drawer! It just looks wonderful and so many great ideas!! Thanks for hosting! Beautiful features and thanks for hosting and no I am not done yet either. I really do love your little saplings too, my friend! And...could they have fit that old wooden box any more perfectly? 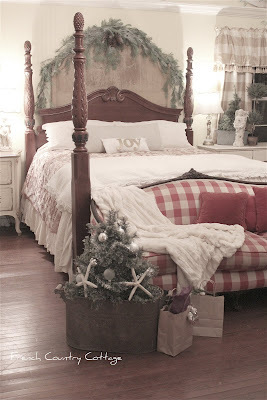 A lovely Christmas vignette! Ohhh...I missed your bedroom so I'm heading over there as soon as I leave this note. Thank you so much for hosting this lovely party for us, dear friend! I love all of the beautiful posts that you chose to showcase this week...simply fabulous!!! Have a wonderfully sweet and blessed Christmas, dear friend! Courtney, what lovely features! Thanks so much for hosting! I love the imitation greenery! Your bedroom is wonderful. Wish mine looked like that. Mine is dressed for the holidays too, but that means that it is a messy wrapping station with boxes, tissue, paper, etc. everywhere. One day I should do a post on it!!! What a lovely party! The faux saplings look great in the box. The bedroom is wonderful. Oh...the old box is so cute with the little saplings. You really come up with some inspiring ideas! Happy Holidays! You still have time for everything, just remember to relax! Thanks for hosting...love Tracie's little birdie!! I'm behind on everything Courtney, but hoping to get caught up this weekend! Thank you for taking the time to host on on this busy weekend! Thank you, Courtney! Busy lady. You've made the season that much more fun! Love all of these inspiring photoa. there is so much to see. thanks for hosting. I love your bitty trees... love! THanks for hosting as always!! Oh that little bird in the nest is adorable.... Happy Friday to you!! P.S. Thank you so much for hosting! Thanks for hosting Courtney! Beautiful group of Christmas links, I'm so excited to start taking a peek! Thanks for featuring my Christmas Tablescape! I'm even further behind than you, no decorations, not even a tree yet! Beautiful features, Courtney! Thank for being a lovely hostess! Thanks so much for hosting. We'd love to have you link up to "What's It Wednesday". You"re always welcome! Those little trees are perfect in the drawer, it looks so pretty. Thanks so much for the feature Courtney, I'm flattered to be included amongst such talented ladies. Those saplings look so real and fit perfectly in that fabulous drawer. Love the features this week! Thank you again for hosting! Hi Courtney, your parties are always inspiring. Love the vintage boxes. They can be re-purposed so many ways. Another of my favorites is old wire baskets. The little saplings are just too cute! Thanks for hosting! Thanks for the feature. Your bedroom is gorgeous and I keep seeing it all over on Pinterest! I love the saplings in the drawer! Love your features, Courtney. Thanks for all the inspiration and for hosting. Love the cloche vignettes! The saplings in the old wooden crates are fab too. Your bedroom - you're putting me to shame (never made it upstairs with my decorating)! Thanks. there you are again with all that green "freshness" around ~ LOL!! well, I DO of course!! Thank you so much for all the inspiration here! I love your box with the saplings!It is hard to believe how soon Christmas will be here. Thank you for hosting your lovely party. Love the little trees. Nature adds so much to the season. All pure gorgeousness! Every feature and every photo from your home...amazing! Thank you for hosting sweet Courtney! I love your taste! Don't feel badly, I have bought one gift but somehow it will all get done. LOVE your saplings and thank you so much for featuring my banner, how cool! I linking up with my snowman this week, thanks for hosting! the little trees are so perfect in the box...cute!!! 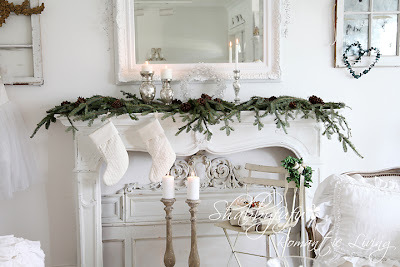 These is so much gorgeous decorating out there, wow! Great list. 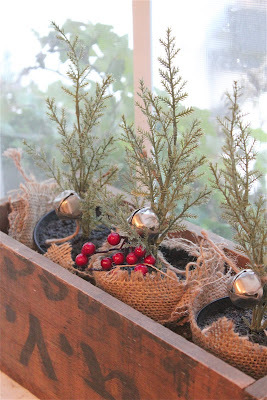 I linked up my planter tutorial and my Grinch tree. I was feeling a bit grinchy this year, thus my grinch tree, less lush but still meaningful and makes me smile. 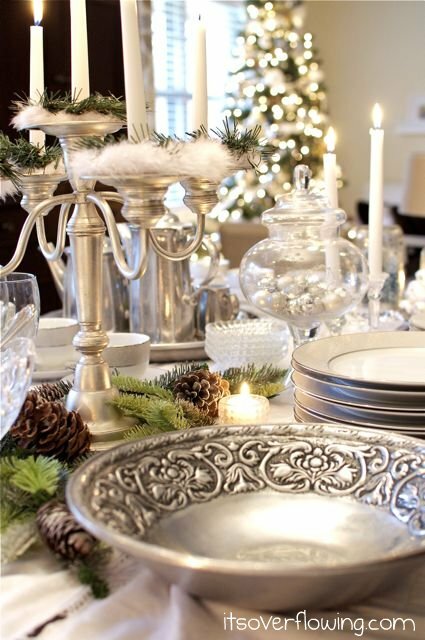 Love the silvery white tablescape. The sapplings are darling! Thanks so much for hosting. Thank you Courtney for being our Hostess for Feathered Nest Friday! It has been a While since I joined in the Fun. Hope you don't Mind! Hi Courtney! Sorry I haven't linked up for a while..I haven't been blogging much...Have a great holiday!